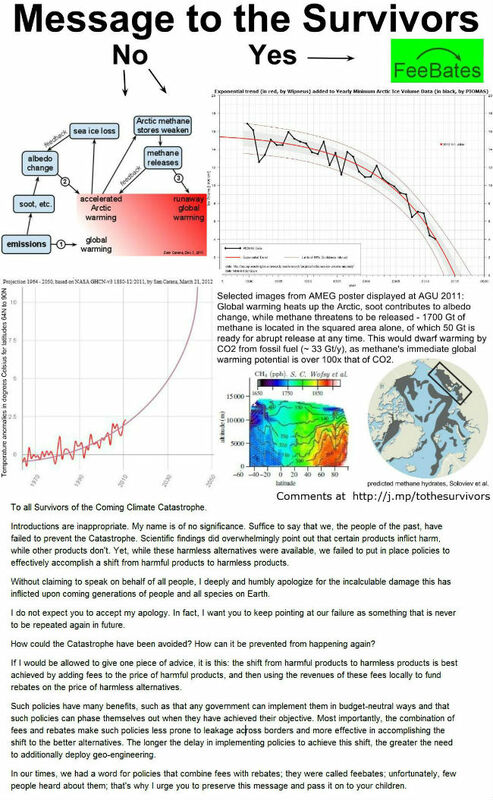 The AMEG poster below was displayed at the Planet under Pressure conference, London, 26 - 29 March 2012. The AMEG pamphlet further below was distributed at this conference. How thick is the Arctic Sea Ice? How thick is the sea ice in the Arctic? One way to find out is to make a journey on-board an icebreaker. The video further below shows the US Coast Guard Cutter Healy, as it travels the Arctic Ocean from August 11 - September 28, 2011, approaching the North Pole from Barrow, Alaska, and back, while a camera takes hourly images, compiled in a YouTube video provided by NOAA. Directly below, an animation showing the route against a backdrop of the Arctic region. Note: the animation further above is a 5.6 MB file that may take some time to fully load. RE: Professor Julia Slingo OBE, Chief Scientist, Met Office, recently provided the report 'Possibility and Impact of Rapid Climate Change in the Arctic' to the Environmental Audit Committee and answered questions from the Committee on Wednesday 14 March 2012. In the responses, the Met Office referred to an earlier presentation by Prof Peter Wadhams, founding member of the Arctic Methane Emergency Group (AMEG). Prof Slingo starts out by saying that the projection of an ice-free summer in 2015, as earlier presented by Prof Peter Wadhams, is actually more credible than the modelling done by the Met Office. This remark may have been a slip of the tongue. Prof Slingo continues to rule out such a date and also rejects PIOMAS data showing an Arctic sea ice volume decline by 75% (from over 17,000 cubic kilometers before 1980 to around 4,000 cubic kilometers now). When asked to elaborate, Prof Slingo says: “We don’t know what the thickness of ice is across the whole Arctic with any confidence”, and “We know there is some thinning but it is not as dramatic as those numbers would suggest.” Prof Slingo also says that the observational estimates of sea ice volume are “still very uncertain”. It is not good scientific practice to use uncertainty - even if it was there - as the basis for ruling something out. Moreover, Prof Wadhams’ conclusion is supported by years of direct observations of the decline of sea ice volume from submarines, taking away much uncertainty, while Prof Slingo doesn’t add any convincing evidence to the contrary. When asked about the possibility of an immediate collapse of ice cover, Prof Slingo gives no credence to that possibility and rules it out altogether “on the basis of the extent of ice”. Prof Slingo here ignores a point raised earlier by herself, i.e. that, apart from melting, strong winds can also influence sea ice extent, as happened in 2007 when much ice was driven across the Arctic Ocean. The fact that this occurred can only lead us to conclude that this could happen again. In fact, the thinner the sea ice gets, the more likely this is to occur. Furthermore, it is accepted science that global warming will increase the intensity of extreme weather events, so more heavy winds and more intense storms can be expected to increasingly break up the remaining ice in future, driving the smaller parts more easily out of the Arctic Ocean. Much of the sea ice loss already occurs due to sea ice moving along the edges of Greenland into the Atlantic Ocean. In conclusion, Prof Slingo has not provided reasons to ignore the observed trend as presented by Prof Wadhams. Furthermore, Prof Slingo has not provided reasons to ignore the possibility of further feedbacks such as large releases of methane from hydrates speeding up sea ice decline. On methane hydrates, Prof Slingo suggests that there was “a lack of clarity in thinking about how that heating at the upper level of the ocean can get down, and how rapidly it can get down into the deeper layers of the ocean”. However, as Prof Slingo earlier brought up herself, strong winds can cause mixing of the vertical water column, bringing heat down to the bottom of the seabed, especially so in the shallow waters of the East Siberian Arctic Shelf (ESAS). 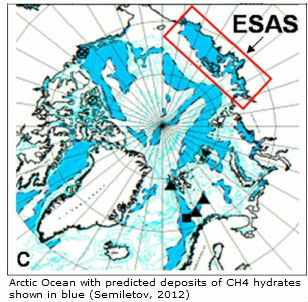 A recent paper shows that “data obtained in the ESAS during the drilling expedition of 2011 showed no frozen sediments at all within the 53 m long drilling core” (Dr. Natalia Shakhova et al. in: EGU General Assembly 2012). In fact, methane in the shallow waters of the ESAS will rise to the surface without much oxidation, while this situation can only be expected to get worse in case of large releases. Prof Slingo ends with some comments on geo-engineering that show she appears to be rather uninformed on this issue as well. These responses were to have provided science-based responses to AMEG's earlier presentation, as well as to elaborate on the report submitted by the Met Office; however, the Met Office's oral and written responses were inaccurate and out of date with current scientific understanding and the rapidly changing situation in the Arctic. AMEG urges the Environmental Audit Committee to consider a new meeting with AMEG so that these issues can be further discussed. Readers are invited to comment and, if applicable, have their names added as signatories. Kwok, R., and D. A. Rothrock (2009), Decline in Arctic sea ice thickness from submarine and ICESat records: 1958- 2008, Geophys. Res. Lett., 36, L15501. Maslowsky, W., J. Haynes, R. Osinski, W Shaw (2011). The importance of oceanic forcing on Arctic sea ice melting. European Geophysical Union congress paper XY556. See also Proceedings, State of the Arctic 2010, NSIDC. Perovich, D.K., J.A. Richter-Menge, K.F. Jones, and B. Light (2008). Sunlight, water, ice: Extreme Arctic sea ice melt during the summer of 2007. Geophysical Research Letters 35: L11501. doi:10.1029/2008GL034007. Rothrock, D.A., Y. Yu, and G.A. Maykut. (1999). Thinning of the Arctic sea-ice cover. Geophysical Research Letters 26: 3469–3472. Rothrock, D.A., J. Zhang, and Y. Yu. (2003). The arctic ice thickness anomaly of the 1990s: A consistent view from observations and models. Journal of Geophysical Research 108: 3083. doi:10.1029/2001JC001208. Wadhams, P. (1990). Evidence for thinning of the Arctic ice cover north of Greenland. Nature 345: 795–797. Wadhams, P., and N.R. Davis. (2000). Further evidence of ice thinning in the Arctic Ocean. Geophysical Research Letters 27: 3973–3975. Wadhams, P., and N.R. Davis (2001). Arctic sea-ice morphological characteristics in summer 1996. Annals of Glaciology 33: 165–170. Wadhams, P., N Hughes and J Rodrigues (2011). Arctic sea ice thickness characteristics in winter 2004 and 2007 from submarine sonar transects. J. Geophys. Res., 116, C00E02. Shakhova, N. and I. Semiletov (2012). 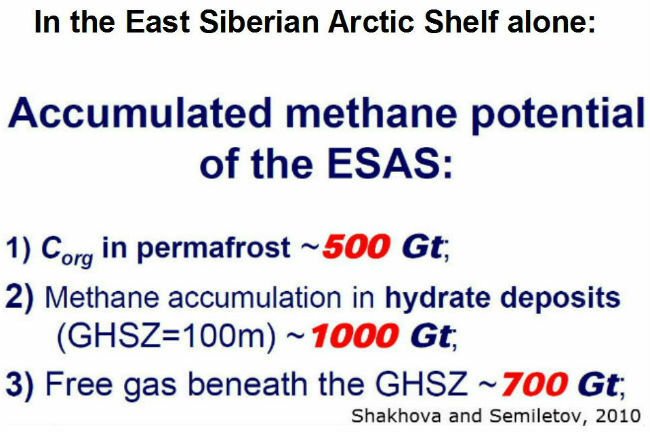 Methane release from the East-Siberian Arctic Shelf and its connection with permafrost and hydrate destabilization: First results and potential future development. Geophys. Res., Vol. 14, EGU2012-3877-1. Note: this is a 3.4 MB animation that may take some time to fully load. Loss of snow and ice can change local temperatures significantly, especially in April/May. 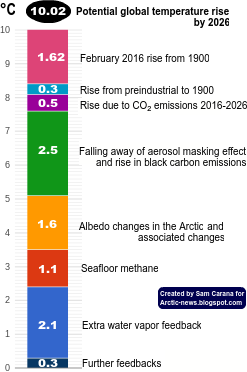 The changes contribute to accelerated warming in the Arctic, which - as the image left shows - is projected to reach 10 degrees Celsius in the 2040s. Temperatures could rise even faster in the Arctic as methane gets released from hydrates. Methane's global warming potential is 105 times as much as carbon dioxide over a 20-year period, and even higher over a shorter period. How much methane is there? Of all the methane located in the Arctic, 50 Gt is ready for abrupt release at any time in the ESAS alone (squared area, image left). Such a release would dwarf warming by carbon dioxide from fossil fuels (~ 33 Gt/y), given methane's high immediate global warming potential. When released from a hydrate, much of the methane will remain concentrated locally, amplifying local warming. For this reason, even a much smaller release could already cause dramatic local warming. There are further reasons why this is the case. Such a release will extend methane's lifetime, while lack of hydroxyl in the Arctic (image left) could further make the methane stay there for decades, at a high global warming potential, while triggering further releases. Meanwhile, rising temperatures will cause firestorms to rage over the tundras of Canada and Siberia, releasing huge amounts of greenhouse gases and soot from peatlands and soil carbon. The recent firestorms in Russia provide a gloomy preview of what could happen as temperatures keep rising in the Arctic. 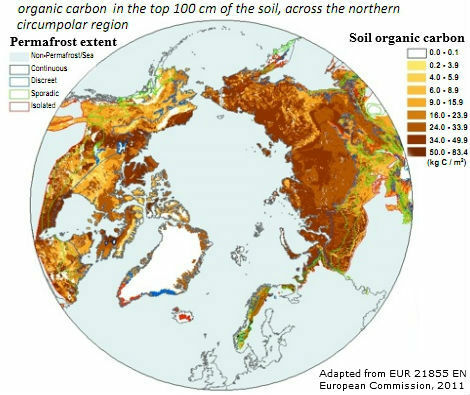 The image below illustrates how much organic carbon is present in the melting permafrost. Much of the soot from firestorms in Siberia could settle on the ice in the Himalaya Tibetan plateau, melting the glaciers there and causing short-term flooding followed by rapid decrease of the flow of ten of Asia’s largest river systems that originate there, with more than a billion people’s livelihoods depending on the continued flow of this water. A new study shows how soot darkens snow and ice, which upsets earth’s radiation balance. A new study from scientists at the Lawrence Berkeley National Laboratory (Berkeley Lab), published in Nature Climate Change, has quantitatively demonstrated that black carbon—also known as soot, a pollutant emitted from power plants, diesel engines and residential cooking and heating, as well as forest fires—reduces the reflectance of snow and ice, an effect that increases the rate of global climate change. Soot can travel great distances and settle back to earth in remote areas far from the emission source. If it deposits on snow-covered areas such as the poles or glaciers, it darkens the snow and ice, with the result that less solar radiation is reflected back into space. More heat is retained near the earth’s surface, speeding up global warming. Although computer models of global climate have estimated this effect, the impact of soot on snow and ice albedo had not been thoroughly measured until now. Odelle Hadley and Thomas Kirchstetter of Berkeley Lab’s Environmental Energy Technologies Division developed new techniques to generate snow in the laboratory, and to mix it in varying concentrations with soot, which normally does not mix well in water. Using these methods, they measured the reflectance of snow with concentrations of soot varying from none to 1,700 parts per billion (ppb), which spans the range of concentrations measured in snow worldwide. The researchers also demonstrated that the greater the grain size of snow, the larger the decrease in its reflectance associated with a fixed amount of soot. Larger-grained snow allows sunlight to travel deeper into the snowpack than smaller-grained snow. Grain size is a proxy for the snow’s age because larger-grained snow is older than smaller-grained snow. Black carbon depositing on snow may cause it to melt and refreeze into larger grains more quickly than would normally occur. The same amount of black carbon causes a bigger decrease in reflectance of large-grained snow than smaller-grained snow. The researchers were able to work out the quantitative relationship between increasing black carbon deposition and snow reflectance reduction with increasing snow grain size—a relationship that had been estimated in computer models, but not verified until now. These results are significant because they provide an experimental check on the methods used to calculate the impact of black carbon on global climate in computer models. Hadley and Kirchstetter’s research show that there is good agreement between their lab measurements and the Snow Ice and Aerosol Radiation (SNICAR) Model, which is being used by the Intergovernmental Panel on Climate Change in its next climate assessment report. Emissions of carbon dioxide are the largest contributor to global climate change. Black carbon, a particle emitted during fossil fuel and biomass combustion, adds further warming. “Theoretical calculations suggest that small amounts of soot, 10 to 100 ppb by mass, can decrease the reflectance of snow 1 to 5 percent,” says Hadley. “This reduction contributes to climate change because it allow less of the sun’s radiation to reflect back into space. Snow is the most reflective natural surface on earth.” As snow falls it washes black carbon out of the air onto the snow pack. 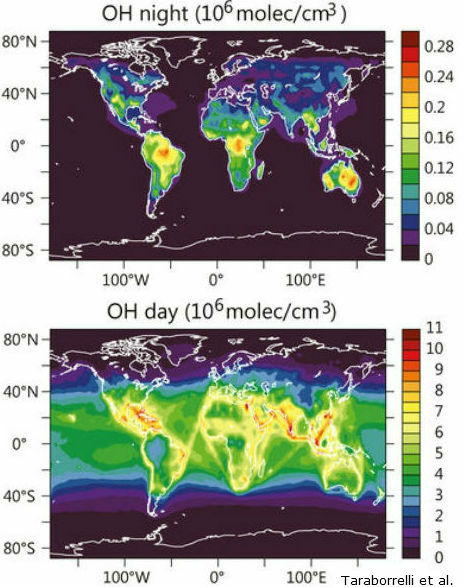 Typical field concentrations of black carbon are measured at 10 to 20 ppb, but in places scientists have measured concentrations as high as 500 ppb. “We needed to pioneer new techniques to do this study, including developing a way to make snow in the laboratory, and to get soot into water,” says Hadley. The researchers solved the first problem with a stack of Styrofoam coolers, liquid nitrogen, and a pressurized spray vessel. They sprayed the water into the top of the cooler stack with liquid nitrogen at the bottom. As the water droplets met the cold air (-100°C to -130°C) below, it turned to snow. They learned to control the size of the snow grains by changing the nozzle size and water pressure through the nozzle. They developed a method of generating soot with no other contaminants (such as oil) with the help of a type of non-premixed methane-air flame created by another Berkeley Lab scientist, Don Lucas. And they captured the soot they created using a filter, and exposed it to ozone, which is known to render soot particles chemically more prone to distribute themselves evenly in water. They developed, as well, a new method for measuring the amount of soot in water. With these methods in place, the team now had a way of creating water with any desired soot concentration, and then turning it into snow, whose reflectance they could measure. They developed ways of using an integrating sphere-equipped spectrometer to measure the reflectance of snow. In addition to the experimental work, they estimated the effect of black carbon on snow using the SNICAR model as a step toward verifying the impacts predicted by climate models. SNICAR was developed by former Berkeley Lab researcher Mark Flanner, now at the University of Michigan. Hadley’s and Kirchstetter’s research provides strong experimental evidence that the climate models are correctly estimating the effect on climate of less solar radiation reflected back into space because of the decrease in snow and ice’s reflectance. In future work, they aim to investigate if the black carbon is causing the earth’s snow and ice to melt faster, an effect that scientists suspect may be happening, but has not yet been demonstrated. Previous research by former Berkeley Lab scientist Surabi Menon suggests that black carbon contributes significantly to the melting of glaciers in the Himalayas. They are also working with the University of California’s Central Sierra Snow Lab to begin studying how black carbon travels through snow as the snow pack melts. This research was supported by the California Energy Commission’s Public Interest Energy Research program, the U.S. Department of Energy Office of Science, and a Lawrence Berkeley National Laboratory E.O. Lawrence Fellowship for Hadley. 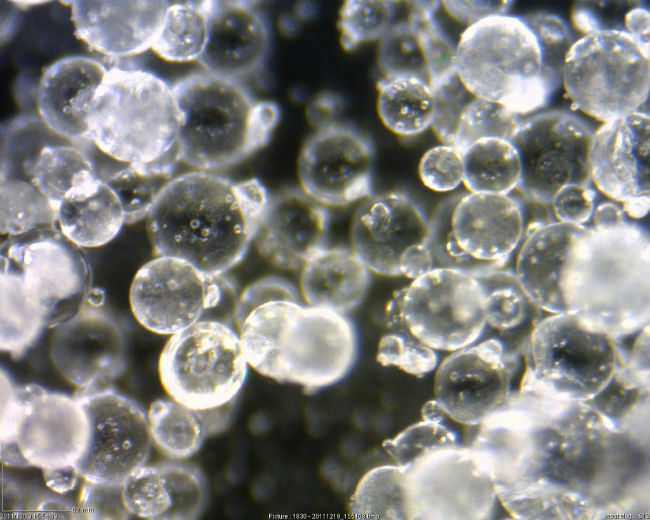 The article “Black Carbon Reduction of Snow Albedo” can be found online here. 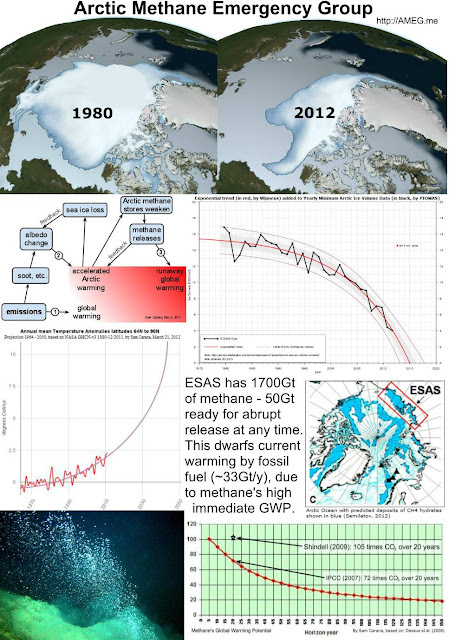 We declare there now exists an extremely high international security risk* from abrupt and runaway global warming being triggered by the end-summer collapse of Arctic sea ice towards a fraction of the current record and release of huge quantities of methane gas from the seabed. Such global warming would lead at first to worldwide crop failures but ultimately and inexorably to the collapse of civilization as we know it. This colossal threat demands an immediate emergency scale response to cool the Arctic and save the sea ice. 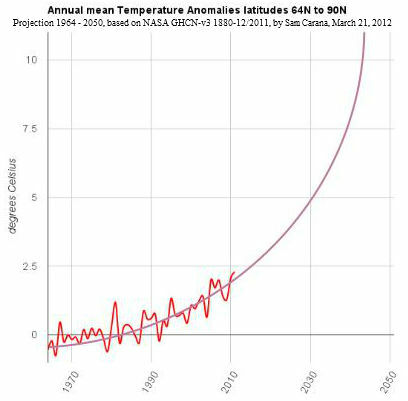 The latest available data indicates that a sea ice collapse is more than likely by 2015 and even possible this summer (2012). Thus some measures to counter the threat have to be ready within a few months. The immediacy of this risk is underlined by the discovery of vast areas of continental shelf already in a critical condition as a result of the warming of the Arctic Ocean seabed. 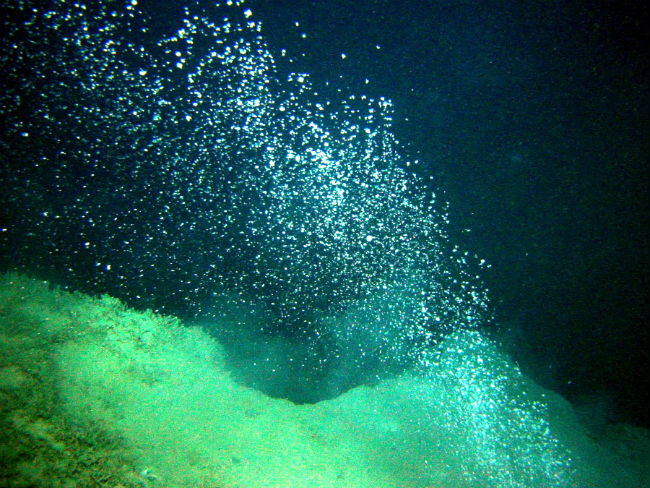 Increasingly large quantities of methane are being emitted from the seabed. Moreover there is the possibility of methane held as hydrates or under thawing permafrost being suddenly released in very large quantities due to some disturbance such as an earthquake. The quantities of methane in the continental shelf are so vast that a release of only one or two percent of the methane could lead to the release of the remaining methane in an unstoppable chain reaction. Global warming would spiral upward way beyond the 2 degrees which many scientists consider the safety limit. However we do not take a defeatist attitude towards this extremely dangerous situation. The present challenge to overcome almost impossible odds is reminiscent of World War 2. There exist the talent, technology and engineering skills to fight against these odds and win, given determination, focus and collaboration. Governments must adopt a plan of action to cool the Arctic, halt the retreat of the Arctic sea ice and slow the release of methane. A variety of means of cooling the Arctic are available, some of which may be classed as geoengineering. Governments must also take rapid measures to reduce short-lived climate forcers, such as methane and black carbon (commonly known as soot), especially where emitted at high northern latitudes. Governments must furthermore put in place the necessary monitoring procedures for assessing the situation, allowing accurate modelling and determining the effectiveness and safety of the measures taken. But intervention on a large scale has to be accepted in order to avert the ultimate catastrophe of runaway global warming. No amount of adaptation or insulation could make that survivable. We demand for all nations to pull together in battle against these threats. We consider it a moral duty: to fight against destruction of the climate system in order to protect the lives of all citizens. Note that AMEG considers that the cooling of the Arctic should be seen one of many efforts to bring the atmosphere and oceans back towards their pre-industrial state, especially since such efforts reduce both immediate and longer-term risks arising from Arctic warming, sea ice retreat and methane release. AMEG is fully supportive of these efforts. 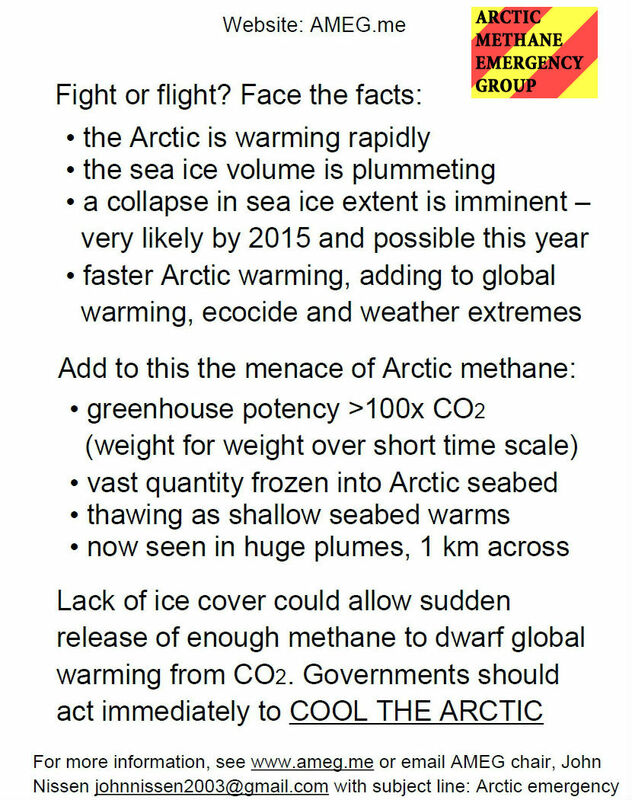 In a Jan. 4 post on "Real Climate" (1), David Archer addressed those who are raising concern about the speed of ice loss in the Arctic and the resultant potential for warming water temperatures to thaw frozen methane and release it as gas to the atmosphere. In essence, he dismissed such concern as a form of unfounded alarmism making "much ado about nothing". In this rebuttal, I would like to respectfully challenge this dismissive stance and assert that severe dangers are arising in the Arctic which instead call for the full attention of humanity. The present thinning and retreat of Arctic sea ice is one of the most serious geophysical consequences of global warming and is causing a major change to the face of our planet. A challenging characteristic of the behaviour is that both the rate of retreat (especially in summer) and the rate of thinning in all seasons have greatly exceeded the predictions of most models. The sea ice cover of the Arctic Ocean, particularly in summer, has been in retreat since the 1950s at a rate of about 4% per decade which has recently increased to 10% per decade. More seriously, the thickness of the ice has diminished. Satellites can track ice area, but ice thickness distribution can be most accurately measured by sonar from underneath the ice. Since 1971, I have been going to the Arctic in UK nuclear submarines, mapping the ice thickness using upward-looking sonar along the vessel’s track. U.S. submarines have also allowed such availablity. Opening these submarines to scientific work has been a marvelous service to climate research. It was thanks to submarines that I was able to show for the first time that the ice in the Arctic is thinning (in a 1990 paper in Nature (2), showing a 15% thickness loss in 11 years), and recent work from UK and US submarines now shows a loss of more than 43% in thickness between the 1970s and 2000s, averaged over the ocean as a whole (3). This is an enormous loss – nearly half of the ice thickness – and has changed the whole appearance of the ice cover. Most of the ice is now first-year rather than the formidable multi-year ice which used to prevail. The thinning is caused by a mixture of reduced growth in winter, because of warmer temperatures and more heat in the underlying water column, and greater melt in summer. A change in the direction and speed of ice motion has also played a role, with the ice departing quicker from the Arctic Basin through Fram Strait rather than circulating many times inside the Arctic. The summer (September) area of sea ice reached a record low in 2007, almost matched in 2011, but what is most serious is that the thinning continues. It is inevitable that very soon there will be a downward collapse of the summer area because the ice will just melt away. Already in 2007, measurements indicated that during the summer there were 2 metres of melt off the bottom of of ice floes in the Beaufort Sea, while the neighbouring first-year floes had only reached in 1.8 metres during winter – so all first-year ice was disappearing. This effect will become more important and will spread throughout the Arctic Basin. There is currently disagreement about when the summer Arctic will become completely ice-free. It depends on what model is being employed. My own view is based on purely empirical grounds, that is, matching the observations of area from satellites with observations from submarines (combined with some modelling) of thickness to give us ice volume. 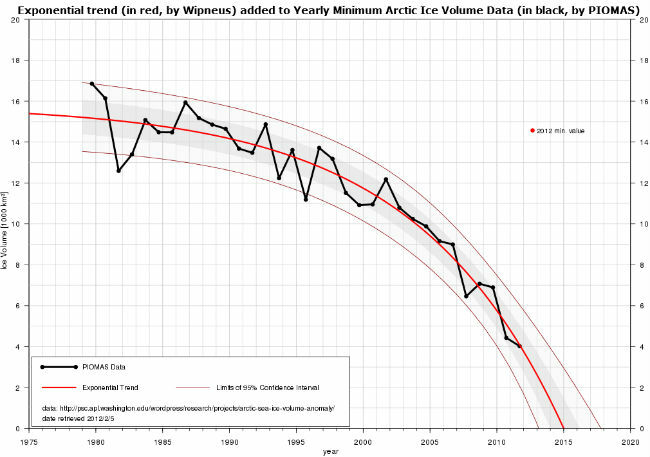 If we think in volume terms instead of area terms, the downward trend is more than linear, in fact it is exponential, and if extrapolated it gives us an ice-free summer Arctic as early as 2015. Others have talked of later dates, like 2030-2040, but I do not see how the trend of summer ice volume can possible permit this. Those who agree include W Maslowsky, a leading ice modeller (Naval Postgraduate School, Monterey), and the PIOMAS project at University of Washington which generated the data shown below (4). Minimum volume of Arctic sea ice in midsummer, based on areas observed from satellites and thickness trends inferred from submarine observations. Extrapolation leads to a zero volume in 2015. It must be pointed out that this perspective stands in direct contradiction to very complacent statements about the Arctic sea ice from the IPCC in the AR4 report of April 2007 saying the sea ice was very likely to last beyond the end of the century. The ice retreat is having major impact on the planet. The Arctic is the most rapidly warming region on Earth. It has become widely accepted that Arctic amplification of global warming is due to the albedo effect of sea ice retreat. The increased open water reduces the albedo (fraction of solar radiation reflected into space) and causes warming at high northern latitudes to be 2-4 times as fast as in the tropics, with enormous implications for climatic instability. Secondly, the summer retreat of the ice from the wide Arctic continental shelves (particularly the East Siberian Sea) allows the shallow surface layer to warm up, bringing temperatures of up to 5 degrees C right down to the seabed. Quantification of this affect has only very recently been attempted, in a paper to the 2011 AGU by Hudson (5). The startling conclusion is that the rate of warming of the Arctic could double or triple, once the Arctic Ocean is ice-free in September. And it could double or triple again, once the ocean is ice-free for half the year. But the timescale makes this all the more worrying. The scientific community has drawn attention to the risk of dangerous climate change if the world does not reduce emissions of carbon dioxide - a worthy and critical objective. However, I wish to point toward a much more immediate problem that does not seem to be recognised among the climate change community at large: This is the problem of rapid retreat of Arctic sea ice, and likely consequence of catastrophic methane feedback. These rapidly warming temperatures are accelerating the melt of offshore permafrost, releasing methane trapped as methane hydrates and causing large plumes of methane to appear all over the summer Arctic shelves (observed for the last 2-3 summers by Semiletov and colleagues on joint University of Alaska – Far Eastern Research Institute cruises). Methane levels in the Arctic atmosphere have started to rise (measured by Dr Leonid Yurganov, Johns Hopkins University) after being stable for some years. As methane is a very powerful, if short lived, greenhouse gas, this will give a strong upward kick to global warming. There have been warnings that a major methane outbreak may be imminent. Given that this "train" would be one way and feed upon itself in a way that might well be unstoppable by humanity, it would seem to be a classic case where the precautionary principle should immediately be invoked. When Archer dismisses the legitimate concern that conditions in the Arctic are approaching a potentially catastrophic tipping point, he is deflecting away a vitally important perspective that needs to be communicated to the world's policymakers. I strongly urge Archer to re-consider his position. It is also my understanding that one of the recipients of Archer's "dismissal" charge was documentary film-maker Gary Houser. 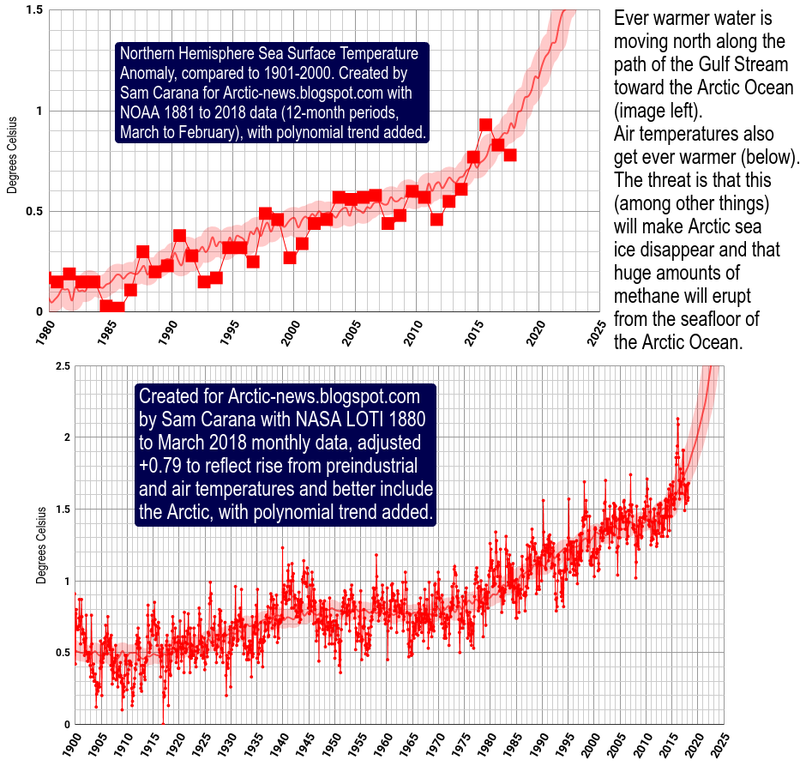 Houser had submitted an earlier rebuttal to Archer - based on his interviews with scientists related to a program on the issue of Arctic methane - which was rejected by "Real Climate" on the grounds that he himself is not an accredited scientist. I have read his rebuttal and wish to link to it here (10), as I believe it contains points of merit I do not have space to address here. (2) Wadhams: 1990 Wadhams, P. Evidence for thinning of the Arctic ice cover north of Greenland. Nature, Lond., vol 345, 795-797. Professor Peter Wadhams is author of a recent science paper entitled "Arctic Ice Cover, Ice Thickness, and Tipping Points". It was published in AMBIO: A Journal of the Human Environment produced by the Royal Swedish Academy of Sciences. Link to abstract and full text preview of published article: Arctic Ice Cover, Ice Thickness and Tipping Points - SpringerLink This paper was written for the Arctic Tipping Points Project (www.eu-atp.org) - a large scale integrating project funded by the European Union 7th Framework Programme. 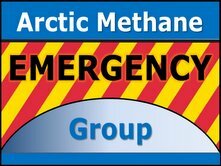 You are invited to attend this APPCCG event with the Arctic Methane Emergency Group (AMEG), an NGO founded in October 2011 and supported by world renowned scientists. At the same time, thawing and release of previously frozen methane previously trapped under the Arctic sea bed and in the surrounding tundra, is also increasing alarmingly, a process that will accelerate as the Arctic sea responds to the loss of sea-ice protection. Evidence will be presented of what is actually happening in the Arctic, in regard to the reduction of the ice sheet, the rate of methane release and details of the basic driving mechanisms in the form of warming ocean currents and increasing solar absorption in the region. The meeting will also focus on the possible ways of halting this process and managing the level of the solar radiation currently reaching the Arctic, and will explore the challenges inherent in applying the technology in one of the most inhospitable regions on Earth. The panel discussion will be followed by a question and answer session. If you would like to attend this meeting, please contact Neha Sethi at the APPCCG Secretariat on climatechangegroup@carbonneutral.com or tel: +44 (0) 20 7833 6035. Please enter by St. Stephen’s Gate, and allow about 15 minutes to pass through security.